Ra running as a VST plug-in within Cubase SX — Kompakt performed flawlessly throughout the test period. 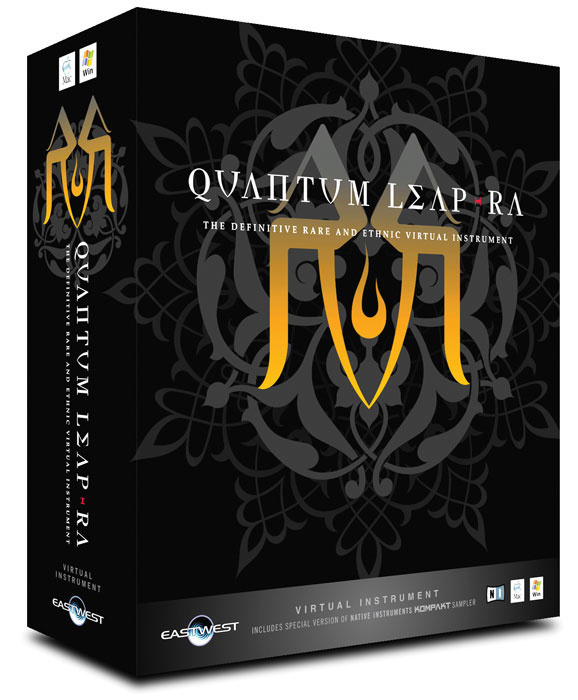 The latest collaboration between East West and Quantum Leap is the Ra virtual instrument. For those that don't recall their ancient Egyptian mythology, Ra was regarded as the creator of everything, and the god of the sun (don't worry, I couldn't remember that either — but it's all explained in the excellent PDF manual which also gives some background on the instruments in this collection). The library producers thought this would be a suitable title for an ambitious collection of rare and ethnic instruments from around the globe. As shown by the screenshots throughout this article, like a number of other recent products from both East West/Quantum Leap and Zero G, Ra uses a custom version of Native Instruments' Kompakt as the software sample-playback front end. This is identical to the version of Kompakt included with the Colossus and Vapor libraries I looked at in February and July's SOS, so there is little need to repeat the details of the front end itself. However, it is worth recalling that the samples can only be accessed via the supplied version of Kompakt (or via the full version of one of NI's software samplers). This offers some copy protection to the producers of the library, as on-line registration is required via the Native Instruments web site, but unfortunately, it does prevent users from running different sample-playback software. Like a number of the newer breed of sample libraries, Ra is going to keep hard-drive manufacturers happy; at 14GB in size, it is supplied on four DVD-ROMs. The samples themselves cover a range of 'world' instruments, drawn from six major regions — Africa, the Americas and Australia, Europe, the Far East, India, and the Middle East & Turkish Empire (presumably the former Ottoman one). A list of the instruments and ensembles supplied in Ra is provided in the ' Ra Round Up' box. 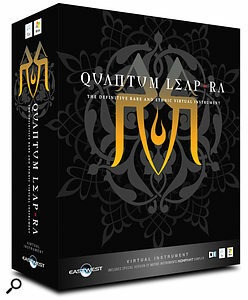 While there is a reasonable selection of drum and percussion instruments in the list, the emphasis is on melodic instruments, as Quantum Leap are marketing Ra as a separate complement to their existing Stormdrum drum and percussion library. 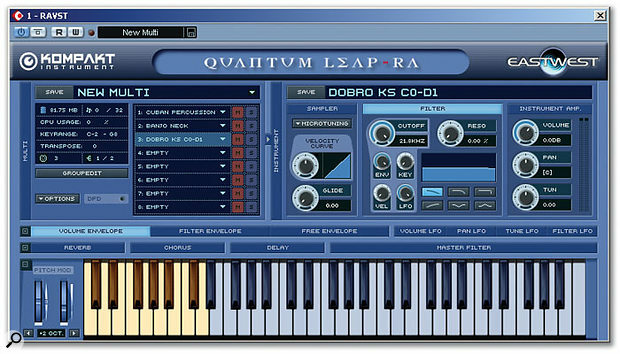 Regular SOS readers may recall Quantum Leap's earlier Rare Instruments sample library, which impressed Martin Walker back in SOS September 2001 issue, and was originally released on three CD-ROMs (in Akai and Gigastudio formats) at a cost of just over £300. Indeed, as explained in Ra 's documentation, Rare Instruments can be seen as the starting point for this library, as all the sounds from Rare Instruments are included. However, this earlier material forms only 10 percent of Ra — the vast majority of the sample library is new content recorded specifically for this project at the high-profile Ocean Way studios in Hollywood. The Direct From Disk (DFD) extension has to be downloaded from the NI web site to allow Kompakt to stream the Ra samples from the hard drive. 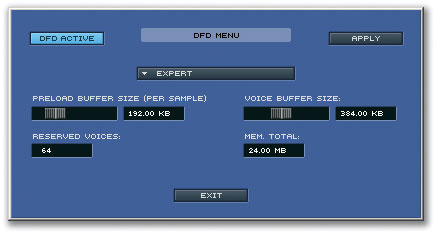 As might be expected given the overall size of the library, the sampling itself is both high resolution and comprehensive. The majority of the instruments have been recorded in several articulations and, by using keyswitch Programs, it is possible to access these various performance styles and 'play' each instrument. Two types of simpler Programs (termed 'Live' and 'Elements' Programs) are also provided. The former provides a basic articulation with some velocity-sensitive articulation changes while the latter generally contains a single articulation and FX-style performances. All the instruments have been tuned to a western equal-tempered scale, even those that don't usually play in this scale, although this is probably a very sensible move, given that the majority of users will wish to mix these instruments with others in their collection. However, a few Programs are provided in an un-tuned form for those that want a more authentic musical experience. Within Kompakt, the yellow keyswitches allow you to move between different sample performance layers for the playable (blue) zone on the keyboard. Having said that Ra places its emphasis on melodic instruments rather than percussion, three of the five African instrument groups are based on drum or percussive instruments. In Kompakt, the five groups are Bells, Drums, Pitched Percussion, Plucked and Shakers. The drum and percussive instruments are a good mixture of the familiar (such as the Djembe and the Udu) and the less familiar (for example, the Berkete) and, while Quantum Leap might like you to buy their Stormdrum collection to fully satisfy your lust for the sounds of things being beaten with hands and sticks, there are some excellent options here. For example, the 'Djembe Ensemble' instrument contains samples from a number of different Djembe drums, each with several different articulations producing a very full sound with plenty of low-frequency energy. These various samples are spread across the keyboard and there seems to be a healthy number of velocity layers for each key, making the samples very playable. Equally impressive is the 'Ewe Drum Ensemble' (consisting of samples from Atsimevu and Kidi drums); the samples have plenty of body and sustain. Other highlights would be the 'Batas' and 'Kidi' patches but there are also some really good shakers (both wooden and metal). Of the pitched instruments, my particular favourites would be the various Kalimbas and the beautiful-sounding Kora. The latter, which is played in various parts of Africa (including Gambia and Senegal), sounds very harp-like but with a touch of Guitar or Koto thrown in for good measure. While it is often used for playing chords, the sound also lends itself to slow melodic lines — and in this mode, I found it created a relaxed, tranquil mood. The instruments from the Americas and Australia region are organised into three groups in Kompakt: Percussion, Plucked and Wind. Two instruments come under the Percussion section — the Afro-Brazilian Berimbau and an ensemble of Cuban percussion consisting of Congas, Bongos and Timbales. Both of these sampled instruments are fairly basic in construction but the sounds themselves are of a high quality. Things get a bit more interesting in the Plucked category. The Banjo and Ukelele both sound excellent, while the keyswitched versions of the Mandolin and a Washburn Guitar (built in the 1890s) provide some very useful performance options. However, perhaps the star of the show is the Dobro. The keyswitched Program offers 15 different performance articulations, including slides (up, down and various speeds), tremolo and mutes. While constructing a 'live' performance using any keyswitch system requires a good deal of practice and patience, the options here mean that some very convincing results can be produced. And this is, of course, helped by the fact that the instrument itself sounds as though it has been well played and very well sampled. The Wind group comprises various Didjeridoo options, a Pan Flute and a First Nations Cedar Flute. The two flutes feature keyswitched performances offering options such as vibrato and staccato playing. Again, the basic tones are excellent, and the performance options at least make for a little added realism if you want to create your own South American pan pipe extravaganza. Plenty of options are provided for the Didjeridoo. These include a selection of drones, some special effects created by various tonguing techniques and a large selection of 'grooves' that feature cycling drones recorded at different pitches and tempos. They all sound excellent. African Dual Wooden Shakers (Ewe). If you're unfamiliar with many of the unusual instruments included in this library, descriptions of many of them, with pictures, can be found in Dave Stewart's excellent explanation of some of the more outlandish instruments found in the General MIDI Instrument spec, from SOS December 2001, readable free at www.soundonsound.com/sos/dec00/articles/exotic.htm. The European instruments are split into Bowed, Percussion and Wind groups in Kompakt. The Bowed group offers three instruments; the Bulgarian Gadulka (three playable strings are bowed, while a further 11 sympathetic stings resonate), the Norwegian Hardanger Fiddle (similar to a violin but with additional sympathetic strings) and the Hurdy-gurdy. All three are supplied in a range of Programs including a keyswitched instrument with a number of performance articulations. Both the Gadulka and the Hardanger Fiddle are, as might be expected, suitably fiddle-like, but with a characterful rustic edge to the tone. However, for me, the best of the bunch was the Hurdy-gurdy. Having a friend who is a keen Hurdy-gurdy player, I've had plenty of opportunity to hear what this instrument can do. The sampled version here sounds very good indeed and is considerably easier to conjure a tuneful performance from! Aside from a nice range of performance styles and tones, the collection also includes a small number of 'grooves' (to simulate the rhythmic effects that can be created via the wheel) and some nice drones. Many of the instruments, like the Irish Low Whistle shown here, include individual Programs for each performance articulation (Elements) as well as keyswitch versions that combine several of these Elements into a single Program. The Percussion group consists of large, medium and small Frame Drum instruments. While these sound very good, when you consider that each instrument only occupies a small keyboard range, it might have been nice to have a single Program that contained all three drums spread across the full keyboard range. An additional effects Program is included for the large drum, and this includes a large variety of different styles of hit and a small number of performance styles (scrapes, rolls, and so on). The Wind group includes an Alpenhorn (one of those vast horns you see people blowing down Alpine valleys in adverts for the Swiss Tourist Board, usually to a soundtrack of somebody yodelling), a Bagpipe Ensemble, a Bass Recorder, some Highland Pipes, an Irish Low Whistle, Launeddas (a reed instrument consisting of three canes and originating from Sardinia) and the Uilleann (Irish) Pipes. The Bagpipe Ensemble and Highland Pipes are both fairly simple Programs, but are capable of surprisingly convincing results. 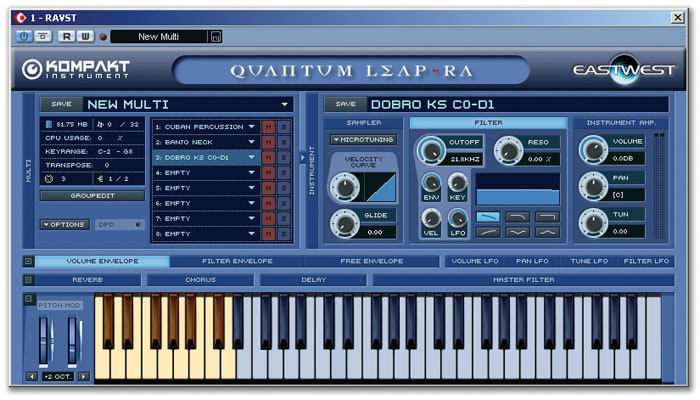 Each features a split keyboard with a lower section containing drones and an upper section available for melodic playing, while velocity-switching introduces some performance variations. Even better are the options with the Uilleann Pipes and the main keyswitch Program also features velocity sensitive performance styles. The results can be extremely effective. The Irish Low Whistle also sounds pretty good, and although the keyswitch Program is perhaps not as instantly playable as that of the Uilleann Pipes, it does offer a very useful range of performance articulations via the keyswitches. Bowed, Percussion, Plucked and Wind make up the four Kompakt instrument groups in the Far East selection. The Chinese Erhu is the only item in the Bowed section, but this fiddle-like instrument is well sampled and has a suitably raspy tone. The keyswitched version includes vibrato, staccato, legato, trill and slide options, as well as various combinations of these. The Percussion section includes a Gamelan ensemble, Gongs and a Japanese Taiko. 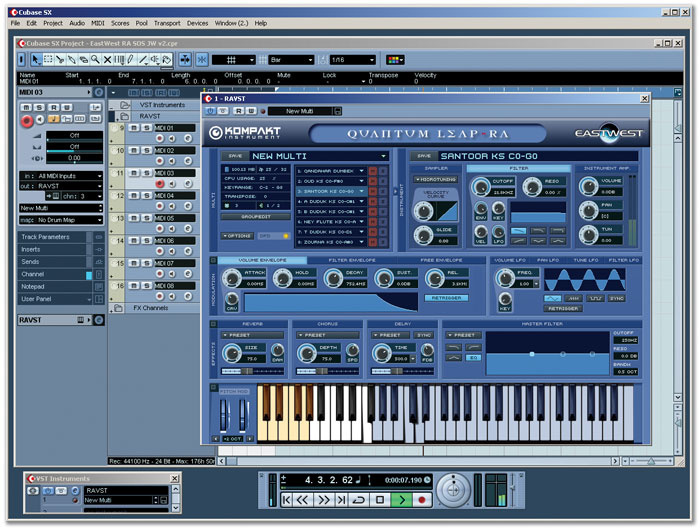 The latter consists of samples from a single large drum with the main Program providing a range of different hits (from thunderous to soft) spread across the keyboard. There is probably enough variety here for most needs — although Stormdrum obviously offers further options. Both Chinese and Thai Gongs are provided and both are wonderful — tonally different, but with plenty of power, and the velocity-sensitive Programs are very playable. The Gamelan instruments consist of Metallophones (not dissimilar to a Vibraphone) and various Gongs. The Programs are fairly simple but the sounds themselves are very good with plenty of sustain. Aside from the Vietnamese Jawharp, the two main instruments in the Plucked sections are the Japanese Koto and Shamisen. Both are provided with keyswitched performance Programs including non-vibrato, vibrato and various other slurs, tremelos and pick scrapes. The sounds are very authentic, and again, with a suitable amount of practice using the keyswitch options, some very convincing performances can be created. Dizi (a Chinese bamboo flute), Rag Dung (a Tibetan Horn) and the more familiar Shakuhachi make up the Wind collection, with keyswitched and individual performance-style Programs provided. The Dizi is beautifully soft at low velocities, but becomes just a little more raspy and piercing at higher velocities, while the keyswitch options provide flutter, legato, staccato, tremolo and trill options amongst others. The Rag Dung is a simpler Program but the sound is suitably horn-like. The best of the bunch, however, is the Shakauachi, which has plenty of performance options and a lovely, breathy tone. The same four groups — Bowed, Percussion, Plucked and Wind — are used to organise the instruments in the India category. In the Bowed group are a seven-string Baritone Violin, a Sarangi (which has three playable strings and between 30 and 40 sympathetic strings), and an Esraj (half-Sitar and half-Sarangi, with four playable strings and about a dozen sympathetic strings). For each instrument, keyswitching provides various performance styles and, for the Sarangi, there is an additional Program that features melodic phrases. In all cases, both the tone and the playing has India stamped all over it — just a few notes is enough to give the listener all the musical clues they need to locate themselves. Given that the Ra instruments do not make use of the Kompakt Modulation or Effects sections, these can be minimised to save a little screen real estate. The Percussion group consists of a small number of Tabla Programs — again, instant 'India' — and has enough options to cover most needs. The Plucked group contains both a Sitar and Tambura. The former provides a good range of performance options, while the latter instrument is much simpler in its construction but still manages to be very playable. The only instrument in the Wind section is the Bansuri (a flute-like instrument made from bamboo). The basic tone is less obviously 'Indian' in flavour (in fact, it's not dissimilar to the Shakuhachi) but the various performance articulations add character. The final regional category is also organised into Bowed, Percussion, Plucked and Wind groups. The Bowed group offers a Middle Eastern Fiddle and String Section. While these are essentially constructed in the same fashion as their European counterparts, the various performance articulations give the resulting sampled instrument a definite Middle Eastern character with plenty of wide vibrato and dramatic slurs. The other Bowed instrument is the Turkish Yali Tambur, which looks a little like a Banjo with an extended neck, but includes sympathetic strings as well as those played with the bow. The tone is like a cross between a fiddle and a banjo but with a rustic (almost scratchy) edge. When combined with the wide range of performance articulations here, the sound can produce some excellent results. The Percussion group contains a solitary Qandahar Dumbek instrument — basic but very usable — while the Plucked group features both the Arabic Oud (a lute-like instrument) and the Persian Santoor. Both feature a range of performance options, but the Santoor has a very distinctive character and instantly evoked film and TV music from the late 1960s (and also Portishead's 'Sour Times' from the Dummy album). In the Wind group, three Duduks (apricot-wood oboes) are included from three different regions; Armenia, Turkey and Bulgaria. Each of these has a somewhat different tone, with the Turkish instrument sounding particularly 'reedy'. A Ney Flute and the Armenian Zourna (which sounded similar to an Indian snake-charmer's pipe to me) complete the collection. While some potential purchasers might quibble about the detailed selection of the instruments provided in Ra (for example, QL's decision not to include a few more percussion choices), there is no argument to be had about the quality. Almost without exception, these instruments are first class. In terms of the recording, performances and sample editing/Program construction, the Quantum Leap team have created something very special here. While the price may mean it is out of the financial reach of some, Ra ought to have an obvious appeal to anyone interested in 'world' or 'ethnic' music — and even the serious hobbyist who makes this kind of music ought to give Ra a test drive. Despite the price, Ra is certainly good value for money. If we don't hear these instruments in everything from low-budget TV music to big-budget Hollywood film scores over the coming months, I'll happily eat my copy of SOS! Despite the high price, excellent value for money. 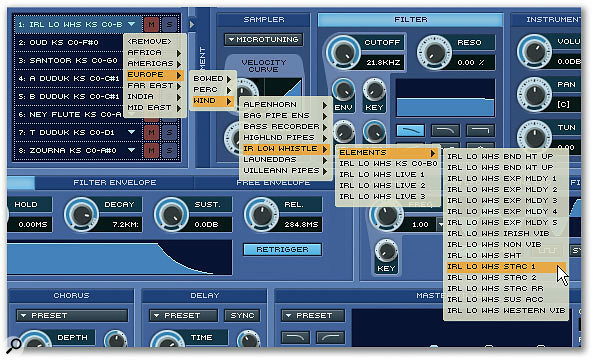 Quite simply, Ra is the best collection of world or ethnic sampled instruments I've ever used. Ideal for anyone with an interest in these music styles, it ought to be of particular appeal to TV and film composers. Arbiter Music Technology +44 (0)208 207 7880.